Single malt Scotch whisky refers to a Scotch whisky that has been produced from only water and malted barley at a single distillery by batch distillation in pot stills. What is a Pot Still? A pot still is a type of still that is used in distilling spirits such as whisky or brandy. The heat is applied directly to the pot containing the wash, the term used for raw whisky or wine, the term used for brandy prior to distillation. This is referred to as batch distillation and differs from the continuous distillation process. At sea level, alcohol boils at 78 °C, while water boils at 100 °C. During the distillation process, the vapour contains more alcohol than the liquid. When the vapours are condensed, the resulting liquid contains a higher concentration of alcohol. In the pot still, the alcohol and water vapour combine with esters, which are chemical compounds and flow from the still through the condensing coil. There they condense into the first distillation liquid, and are termed 'low wines'. The low wines have a strength of about 25 to 35% alcohol by volume, and flow into a second still. The product is then distilled a second time to produce the colourless spirit, collected at about 70% alcohol by volume. The distinctive whisky colour happens through the maturation process of ageing it in an oak barrel, and develops over a considerable time. The largest pot still in the world was in the Midleton Distillery that was built in 1825 in County Cork, Ireland. It had an overall capacity of 31,618 imperial gallons but is no longer in use. Single grain Scotch whisky refers to a Scotch whisky that has been distilled at a single distillery but, in addition to water and malted barley, it may involve whole grains of other malted or unmalted cereals. The term 'Single grain' does not mean that only a single type of grain was used to produce the whisky, the term 'single' simply refers to the use of a single distillery and making a single grain whisky requires using a mixture of grains, as barley is a type of grain and some malted barley must be used in all kinds of Scotch whisky. Excluded from the definition of a 'single grain Scotch whisky' is any spirit that qualifies as a single malt Scotch whisky or as a blended Scotch whisky. The latter exclusion is to make sure that a blended Scotch whisky produced from single malt and single grain that has been distilled at the same distillery does not also qualify as single grain Scotch whisky. Blended malt Scotch whisky means that you have a blend of two or more single malt Scotch whiskies coming from different distilleries. Blended grain Scotch whisky means a blend of two or more single grain Scotch whiskies that come from different distilleries. 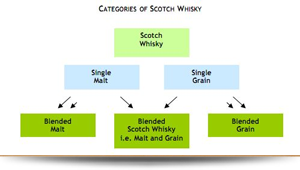 The five Scotch whisky definitions above are structured in a way that the categories are are made to be mutually exclusive. In 2009, new regulations changed the formal definition of blended Scotch whisky to achieve this result, but in a way that reflected traditional and current practice. Prior to the introduction of the 2009 regulations, any combination of Scotch whiskies qualified as a blended Scotch whisky, including for example a blend of single malt Scotch whiskies. As was the case under the Scotch Whisky Act of 1988, regulation 5 of the 2009 regulations stipulated that the only whisky that can be manufactured in Scotland is Scotch whisky. The definition of manufacture is termed as 'keeping for the purpose of maturation; and keeping, or using, for the purpose of blending, except for domestic blending for domestic consumption.' This provision prevents the existence of two 'grades' of whisky originating from Scotland. In other words it prevents the situation of there being one 'Scotch whisky' and a 'whisky like product of Scotland' that complies with the generic EU standard for whisky. According to the Scotch Whisky Association, allowing the production of non Scotch whisky in Scotland would make it difficult to protect Scotch whisky as a distinctive product. The vast majority of grain whisky that is produced in Scotland goes to make blended Scotch whisky. The average blended whisky is 60% to 85% grain whisky. Some of the higher quality grain whiskies from a single distillery is bottled as single grain whisky. Blended malt whisky, which used to be referred to as 'vatted malt' or 'pure malt', which are now terms that are prohibited in the 2009 regulations, are one of the least common types of Scotch, and are a blend of single malts from more than one distillery, possibly of different ages. Blended malts contain only malt whiskies, no grain whiskies, and are usually distinguished from other types of whisky by the absence of the word 'single' before the word 'malt' on the spirits bottle, and the absence of a distillery name. To qualify as a blended malt, the mixed single malt whiskies are matured in the barrel for about one year, after which the age of the vat is that of the youngest of the original ingredients. A blended malt marked with '8 years old' may actually include older whiskies, with the youngest whisky being eight years old before vatting. Blended Scotch whisky constitutes about 90% of the whisky produced in Scotland today. Blended Scotch whiskies contain both malt whisky and grain whisky. They were initially created as an alternative to single malt whisky, which some people considered to be too harsh on the palate. Whisky producers often combine the various malts and grain whiskies to produce a consistent brand style. There are many notable blended Scotch whisky brands around the world today, with some of the most well known ones being Bells, Johnnie Walker, Chivas Regal, Whyte and Mackay, Cutty Sark, J&B, and The Famous Grouse.